Agustin Barrios was at one point an extremely obscure composer. Today his works are a core part of the guitar's repertoire. J.S. Bach was not very well known in his lifetime and was more respected as an organist than composer. But today he is considered one of the greatest composers of western music. Today I want to share something very special with you. They are what I believe to be some of the most deserving pieces that warrant rediscovery on the guitar. They are the 12 Etudes (or L'indispensable) by Leonard Schulz. Before about six months ago, I had never heard the name Schulz! I now think of Schulz as one of the greatest composers for the guitar in the 19th century. My path to finding Schulz was somewhat of a windy one, so I'll try and keep it simple. I first discovered the name Schulz in Pelzer's 150 Exercises for the Spanish Guitar (in the RG archive). In that wonderful method book is a lovely short waltz titled "From L. Schulz's Fantasia dedicated to Mrs Horetzky". I really liked this little waltz and wanted to find more music by Schulz, so I searched through the online libraries I know of. After finding some other short pieces, I eventually came to discover these etudes. My first read through made my spirit glow with excitement, and I instantly fell in love with them. The only problem is that the first edition I found (a copy of the original done by Danish guitarist J.G. Holm) is a handwritten manuscript copy, which contained numerous errors and was difficult to read at times. This is the edition I used as the backdrop in the video above. I have since found another version that is much clearer (not handwritten), published in 1927 by Josef Zuth. This is thanks to someone who is currently writing a dissertation on Schulz, who pointed me towards where I might find another edition. Now the interesting thing is comparing both editions, as they contain different information as to the purpose of some of the Etudes (which I'll talk about in later emails). The newer edition contains a preface in German and French. Below is a translation, courtesy of Google Translate. I have edited it and taken out some little bits of information that I either couldn't understand or didn't feel were of utmost importance. I also underlined a couple of key spots. I hope you will take the time to learn about this great figure of guitar history. More importantly, I hope you will add some of Schulz's etudes to your repertoire. "The guitar had taken root in Vienna before 1800, and had grown indigenous to the community several decades later. Craftsmen and citizens, statesmen, artists, and scholars all played guitar. Chamber music pulled the instrument into finer areas, as the instrument first appeared in house music settings. These early players were inspired by composers, while virtuosos from the land and abroad helped to shape the epoch which is now known as the "glory of the guitar". From this classic Old Viennese school, some works have been reprinted by more recent German guitarists. 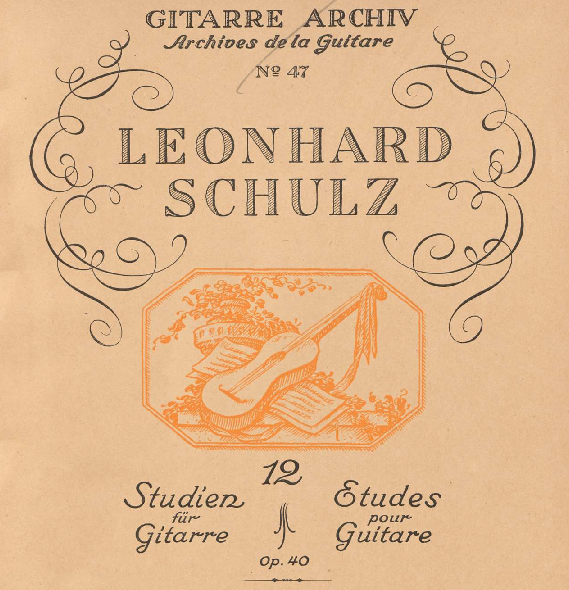 Other valuable dusty yellowing manuscripts are in libraries, including the rare prints of the younger Leonard Schulz, who deserves the attention of serious guitar lovers. It is just astonishing that at a time when archived works are being found and reprinted over and over, no editions of Leonard Schulz's works have been made to give them accessibility to the general public again. The studies in this book are equivalent to the concept of etudes, with the aims being at technical improvement. In addition to their practical purpose, the studies show an interplay of grief and playfulness, containing ingeniously crafted musical ideas." "Leonard Schulz, born in 1814, educated by his father of the same name, debuted as an eight-year old boy in the private music society of the Friends of Vienna, in the hall of the "Roman Emperor" on 3 November 1822. On June 1823 he played with his ten year old brother Eduard, an outstanding pianist. Father and son went on musical journeys, coming to England with Moscheles in 1825, where they played several times before the king. The family of musicians toured through Germany (1827 - 1829) and France (1828). Around 1830 Schulz settled in London, earning a reputation across Europe as a guitar virtuoso. The early life of this outstanding artist is still cloaked in mystery. His works surpass 100 and include Variations, Dance Forms, Fantasies, and Studies for solo guitar. Schulz moved to London after 1830, and it could be for this reason that we have little information about him. The complete title of this book is "L'indispensable or Nine Progressive Exercises for the Guitar". Op. 40. This new edition is the original true, unabridged reproduction of the clean, carefully edited engraving. Derivations from the edition are only to the extent that the fingerings of the modern way of playing have been adapted. Furthermore, fretboard positions (roman characters) were deleted where the fingerings already clearly indicate them."